SAN DIEGO, CA and LAS VEGAS, NV--(Marketwired - Oct 16, 2013) - LightPointe Wireless, the number one manufacturer of all-weather hybrid outdoor wireless bridges and a leader in 60 and 70/80 GHz backhaul solutions, has released a White Paper titled Ultra Low Latency (ULL) Wireless Point-to-Point Networks, by Dr. Heinz Willebrand. The White Paper provides an overview of the technologies utilized in ULL networks, including microwave radios below 40 GHz, V-Band millimeter wave radios, E-Band millimeter wave radios, and laser-based Free Space Optics (FSO). 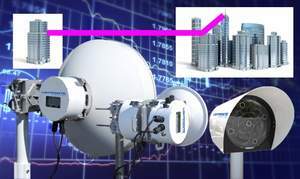 Wireless ultra-low latency networks can be beneficial in numerous industries and applications, such as High Frequency Trading (HFT), emergency response, data center and data storage applications, military applications, and other time-sensitive environments where it is essential that data is transmitted as fast as possible -- even faster than over fiber optics cable. "Over the past couple of years, LightPointe has developed a leadership position in the Ultra Low Latency wireless bridge sector," said Dr. Heinz Willebrand, CEO of LightPointe. "ULL point-to-point outdoor bridges have grown in popularity because, when designed correctly, they can provide data transmission at much lower latency than fiber connections, and are more cost effective. One particular high profile application, where ultra-low latency is extremely important, is High Frequency Trading (HFT) networks. Since reducing the time it takes for electronic trading platforms to make a trade can result in millions of dollars of gain or loss, the stock trading and financial sector has deployed significant numbers of ULL bridges based on millimeter wave and Free Space Optics technologies. LightPointe's engineers have developed the broadest and highest performing portfolio of high capacity ULL products in the industry, providing up to 2.5 Gbps Full Duplex transmission, and equipment terminal latency as low as 10 nanoseconds." The ULL White Paper, in addition to discussing the technologies used in ultra-low latency networks, also presents deployment scenarios and system design criteria including fiber bypass options, and methods of deploying ULL systems in metropolitan areas which do not have available radio frequency spectrum or installation sites, or have rights-of-way issues. LightPointe (www.LightPointe.com) is a San Diego-based manufacturer of wireless Gigabit capacity bridges for enterprise and 4G/LTE carrier markets. The company is owned by a billion-dollar Silicon Valley firm and employees. LightPointe products are on display now at the WISPAPALOOZA tradeshow in Las Vegas, Nevada October 14-18 (Microcom booth #401). The show is held by WISPA, the Wireless Internet Services Providers Association. LightPointe's Ultra Low Latency Air X-Stream Series, which are deployed in time-sensitive applications such as High Frequency Trading.